Faliraki Water Park The water park is the largest in Europe located on the Kallithea road just outside in the popular resort of Faliraki. With a designated area for KIDS ONLY they can enjoy the wet bubble, tipping bucket, pirates ship, funny bridge, Tarzan pool and waterslides. For the rest of us there are thrill rides, Multi rides or Take it easy rides such as the wave pool and Lazy River, a great day out for everyone! Marline Aquarium - Rhodes Town Children can admire the fish of different species whilst having the impression of being under water. They will see turtles, octopus, reefs, sea flowers, clams and numerous fish. Set on the beach front in Rhodes Town makes it worthy of a quick visit. Rhodes Town Park - Passagio Located next door to Rodos Park Hotel is a new modern park. It has swings, slides, skate board ramp, large trampoline, play area and sand pit together with a snack bar/ restaurant. Rodini Park As you approach the out skirts of Rhodes Town coming from Lindos the park is on the 'Rhodes – Lindos 1km avenue' Cool, shady offering a tranquil atmosphere. A short walk through the woodland border with Cypress and Pine Trees will lead to a small playground and a min zoo and home to the resident peacocks. Perfect for children who enjoy a little adventure. Rhodes Ostrich Farm Located on the west side of the island on the road to Butterfly valley is an opportunity to get closer to the feathered birds as well as Donkey’s, Deer, Goats and even enjoy a camel ride! Bowling Alley A great evening out for the whole family. The best one is 200m from the fun fair in Kallithea – Faliraki Avenue called Skypark. It boasts 12 bowling corridors for your entertainment in a pleasant environment where you can enjoy your coffee, food or drink. Doors open at 15.00 till late at night. Cinemas There are two in Rhodes Town, almost next door to each other, one called Pallas, the other Metropol so if you drop by on the spur of the moment you are sure to catch a film, majority are in English with Greek subtitles!!!! Pefkos Glass Bottom Boat Trips Location: Boat trip road Pefkos. Sails to Lindos daily leaving in the morning and returns to Pefkos at approximately 4pm. Sailing time 1 hour each way. Sea cruises around the local coast – sailing time approximately 1.5 hours All trips sail past the cliff from the movie ‘The Guns of Navarone’, the Lions Head, St Pauls Bay and Lindos Acropolis. 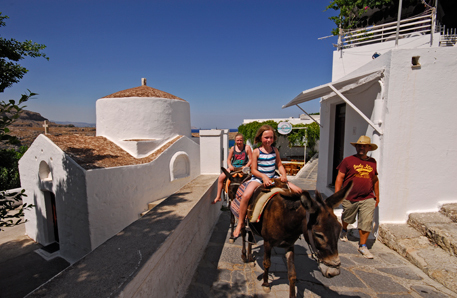 Donkey Rides Above the village of Lindos on top of the hill stands the impressive Acropolis of Lindian Athena. Meander through the alley ways by donkey to the top and see for yourself the spectacular views of Vlicha Bay and St Pauls Bay.